Hello friend! I hope you’ve been having a beautiful week. I spent Saturday outside of the city playing in nature, cooking delicious food, and watching LOTR with one of my dear friends. Then I came home Sunday and went straight to sloth yoga and an incredible play with another friend, so I’m back to work this week rejuvenated and ready to rock! Today I’m going to share a new recipe for kale chips that I came up with that satisfies that salty-sweet craving so many of us experience on a daily basis. Now I’ve got a couple different recipes for kale chips on the blog in case you’re feeling spicy or sour creamy, but what about those times we want something to satisfy our salty sweet cravings? Well friends, I’ve got you covered! Today’s recipe combines the saltiness of nutritional yeast with the sweetness of coconut sugar and the optional earthiness of smoked paprika in case you’re feeling saucy. This recipe can also easily be done in the oven in a relatively short amount of time so it makes a great side dish for dinner. I’m eating them now with some free-range, slow roasted chicken wings I whipped up last night to help power me through my afternoon. Now without further ado, here’s the recipe! In a large mixing bowl lightly toss kale in olive or avocado oil until fully coated. Sprinkle nutritional yeast, palm sugar, sea salt, and smoked paprika and toss once again until covered. Spread into a single layer on baking sheet and place in oven. Roast for 25 to 30 minutes until crisp. You may want to rotate the pan halfway through, but there is no need to flip. Remove from oven and let cool 5 minutes. Place in a bowl and enjoy! Well there you have it! 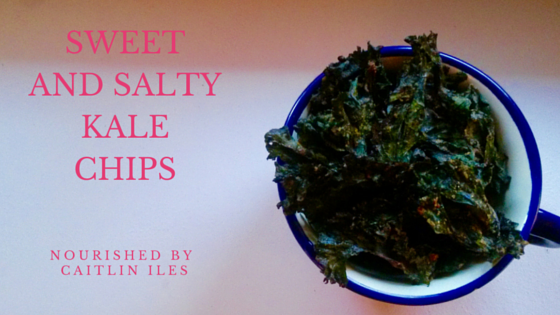 That’s our super simple, sweet and salty kale chips recipe. If you want to stay up-to-date on all my new kitchen creations make sure you follow me on Instagram!